Gina Santis elevates the familiar beach shop seashell wind chime into a work of ceramic art. Ceramicist Gina Santis has a unique gift for creating objects both earthy and ethereal. This indoor/outdoor sculpture is a beautiful example. 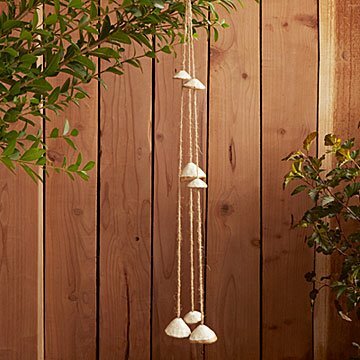 She's taken the charming shell wind chime seen in oceanside shops around the world, and elevated it to a work of art. To make each piece, she shapes six or seven brown stoneware clamshell-like "bells" and finishes them with an off-white glaze. She hangs them on natural jute, so that every breeze sets off a unique chime. Casual enough to hang on a patio or garden, they're also subtly elegant enough for a minimalist apartment. No two perfectly imperfect sets are ever the same. Handmade in Cleveland, Ohio. Gina knew she wanted to be an artist from an early age; she would overtake the kitchen of her childhood home with her art projects. As an adult, she realized her calling was to work clay, and in 2006 she earned her MFA in ceramics from Kent State University. Based in Lakewood, Ohio, she is inspired by the colors, textures, and patterns found in nature. She firmly believes that creativity happens equally in and out of the studio, and loves taking bike rides along the towpath or heading to the lake to get out of a rut.